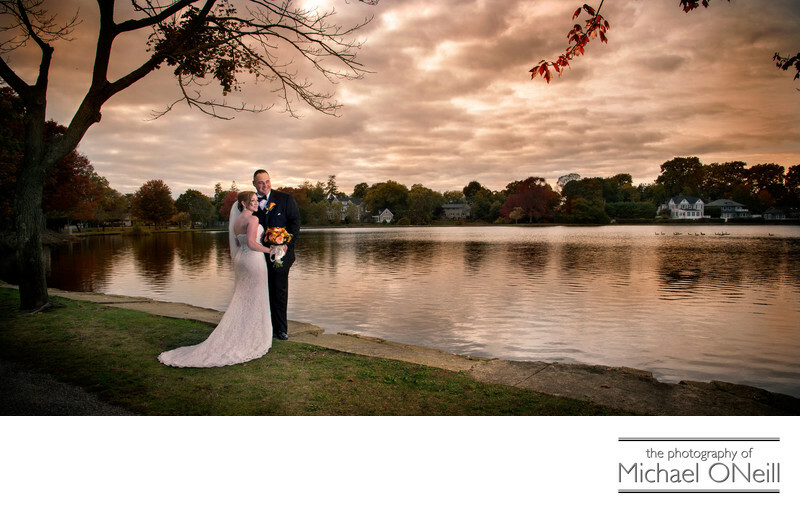 If ever there was a contest for an iconic location for Long Island wedding pictures, Argyle Lake in Babylon, New York would certainly come in near the very top of the list. Conveniently located right on Montauk Highway in Babylon Village Argyle Lake has served as the backdrop for tens of thousands of weddings. I, personally, have been photographing weddings at this popular location since 1978 and still venture into this park today. I’m sure I’ve been here with brides, grooms and their wedding parties well over a hundred times. The small parking area off Main Street is a tight squeeze for the wedding party limousines but gives access to numerous areas of the small park where dramatic wedding pics can be captured. This particular shot was taken in the fall of 2015 on a warm but cloudy autumn afternoon. Surrounded by large trees Argyle Lake Park offers fine fall foliage as a background to your wedding photos. The lake itself offers a nice tranquility despite it’s location on a major thoroughfare (Montauk Highway - Route 27A). The lake spills into a canal which is connected to the Great South Bay by a series of man-made waterfalls with classic stone rails surrounding them. This park has the added benefit of being located just a few minutes from The Venetian Yacht Club, one of Long Island’s premier waterfront wedding venues.